150mg + 12.5mg × 30 tablet $ 2.60 $ 77.95 Buy Now! 150mg + 12.5mg × 60 tablet $ 2.37 $ 141.95 Buy Now! 150mg + 12.5mg × 90 tablet $ 2.10 $ 188.95 Buy Now! 150mg + 12.5mg × 120 tablet $ 2.01 $ 240.95 Buy Now! 150mg + 12.5mg × 180 tablet $ 1.86 $ 334.95 Buy Now! 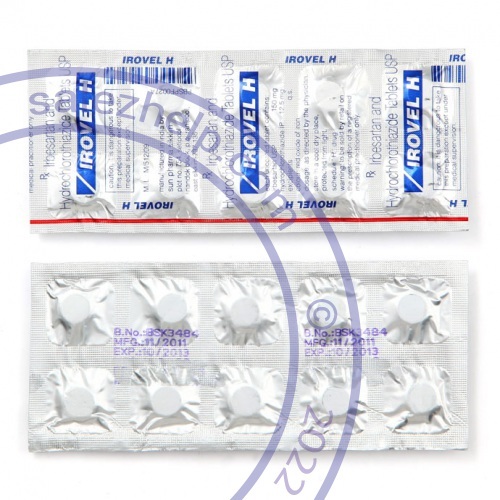 IRBESARTAN; HYDROCHLOROTHIAZIDE is a combination of a drug that relaxes blood vessels and a diuretic. It is used to treat high blood pressure. Take this medicine by mouth with a glass of water. This medicine can be taken with or without food. Take your doses at regular intervals. Do not take your medicine more often than directed. Do not stop taking except on the advice of your doctor or health care professional.